Company Overview - Hangzhou Xiaoshan Shunhe Metal Hose Co., Ltd.
13YRSHangzhou Xiaoshan Shunhe Metal Hose Co., Ltd.
Hangzhou Xiaoshan Shunhe Metalline Conduit Co., Ltd.is a leading manufacturer of production of various National standard, American UL standard and normal standard metal hoses and conduits widely applied in protecting various electrical wires, cables, gas tubes and pipelines in addition to metal fastener. 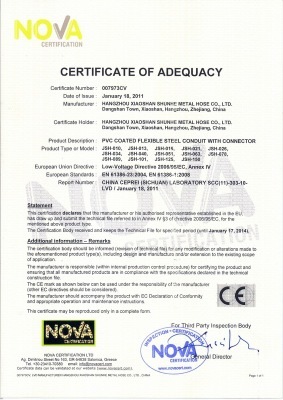 Our products have been ISO9001 certified and SGS environmental protection certified. And the registered mark is "EAGLE" brand. We can control the producing cost very well with the complete set of equipment; our company provides an integrated production line from the cold rolling, cutting, annealing, zincification, tube winding, tube welding to plastic wrapping. Our products are sold well in the domestic markets and are exported to the European and American countries, the Middle East, and Southeast Asia as well. Persisting in the tenet of "Variety in Products, Superior in Quality, Low in Price and Excellent in Service", our company keeps on making innovation to meet the rapidly growing market demand.